Beginning in late antiquity, the Roman Catholic Church was divided into provinces and dioceses. An archbishop possessed spiritual authority over his province and the other bishops (suffragans) in the province as well as normal episcopal powers over his own archdiocese. Around 1500, for example, the archbishop of Cologne had as suffragans the bishops of Cambrai, Liège, Utrecht, Münster, Osnabrück, and Minden. The Empire’s largest province, Mainz, contained a dozen suffragan dioceses. Certain bishoprics were exempt. That is, they belonged to no province and stood directly under papal authority. This was the case with the Benedictine Abbey of Fulda, which was granted an exemption in 751. 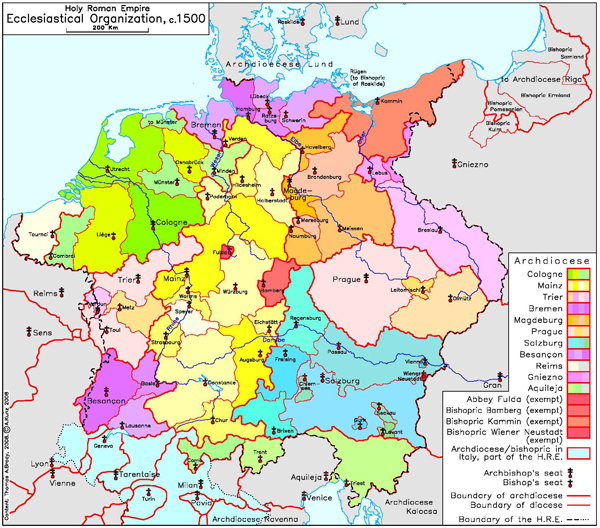 Largely complete by the year 1000, the ecclesiastical organization of the Holy Roman Empire of the German Nation was thus much older than the early modern configuration of secular territorial states. Trier was established by the sixth century, Mainz by 781/82, Cologne in 795, and Salzburg in 798. The northern and eastern provinces were younger. Bremen was founded in the ninth century, Magdeburg in 968, and Prague in the fourteenth century. The template of provinces and dioceses, on the one hand, and the territories secular and ecclesiastical, on the other, did not match up. This lack of fit, which the map shows, meant that as the lay princes’ desire to command the clergy of their territories grew, so did their reasons for resenting the spiritual parcellization of their states. Bavaria, for example, lay in eight different dioceses, not one of which had its seat in the duchy itself. The Saxon lands lay in twelve different dioceses. After the issuance of the Golden Bull of 1356, the archbishops of Cologne, Mainz, and Trier also held the office of Imperial elector. Together with four leading secular rulers (the King of Bohemia, the Count Palatinate, the Elector of Saxony, and the Margrave of Brandenburg), they elected the King of the Romans (i.e., the German king) and emperor-elect. Please click on print version (below) for a PDF file with enhanced resolution. This file is best viewed at 200-300%.